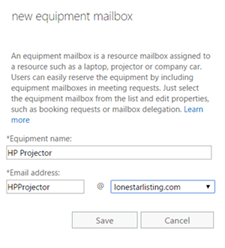 Set up mailboxes so people in your organization can reserve resources, such as conference rooms and audio-visual equipment. Doing this lets people know the availability of these resources when scheduling a meeting. You need to have administrator permissions to add resource mailboxes. Log in to the Exchange Admin Center with your Office 365 email address and password. In the left pane, click Recipients, and then click resources. 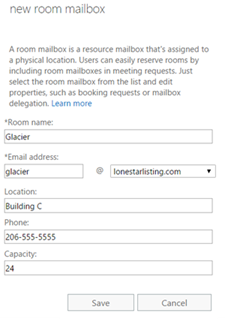 In the new room mailbox dialog box, enter the information about the room, and click Save. In the new equipment mailbox dialog box, enter the information about the equipment, and click Save.